While you're going to have to keep waiting for Hulk-A-Hulk-A Burning Fudge to become a real flavor, there are plenty of reasons to celebrate Ben & Jerry's right now. OK. There's really just one big one: Free ice cream. Like winter in Game of Thrones, it's coming (though it's not going to take six years to arrive). The home of Wayne'Swirled is bringing back its annual Free Cone Day giveaway for 2019, where you can, unsurprisingly, get a free ice cream cone (or a cup, if that's more your speed). The celebration is taking place at Ben & Jerry's Scoop Shops across the world on Tuesday, April 9. Get in line, they'll hand you a cone (or cup). You don't have to buy anything at all. You just have to find your nearest Ben & Jerry's shop. Can't decide which ice cream flavor you're craving most? Pick one, then get back in line for another one. Yeah, that's 100% legal. The press release says waiting in line for seconds is absolutely fair game. The company expects to dish out more than a million scoops over the course of the day in appreciation of ice cream lovers everywhere. "We're nothing without our fans," Ben & Jerry's CEO Matthew McCarthy said in a statement. "This is one of our favorite days of the year. It's a special tradition, and I can't wait to see all the smiles and happiness Free Cone Day brings. It's all about saying thank you to our fans." 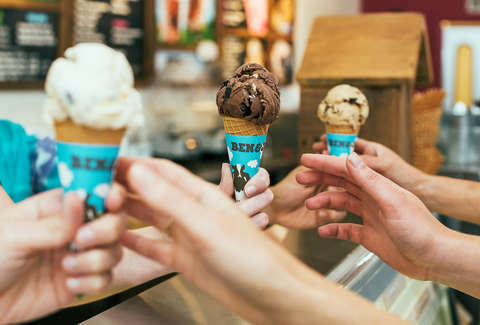 Since you're not limited to any single flavor on Free Cone Day, here's a guide to the absolute best flavors Ben & Jerry's Scoop Shop has to offer. Want even more free food today? Check out our running list of all of the best free food giveaways and other foods deals that you can get right now. You're welcome!